Reading Matthew provides thorough guidance through Matthew's story of Jesus. Garland's commentary reveals the movement of the story's plot while also highlighting the theology of Matthew. 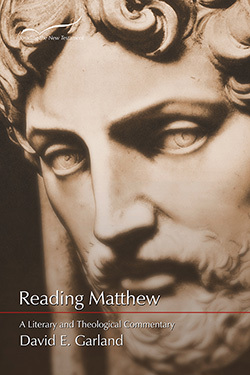 Reading Matthew is an essential book for students and ministers studying the first Gospel. David E. Garland became Truett Seminary's fourth dean on June 1, 2007. He also served as interim president of Baylor University from August 2008 until May 2010. He received his M. Div. and Ph.D degree from The Southern Baptist Theological Seminary. He served on the Southern faculty for 21 years, was Chairman of the Biblical Division from 1992-1997, and was the Ernest and Mildred Hogan Professor of New Testament Interpretation from 1993 -1997. Dr. Garland did post-graduate study at Eberhard-Karls Universitaet, Tuebingen, Germany in 1984-85 and at Macquarie University, Sydney, Australia in 1992-93. He has authored, co-authored, and edited twenty books, including The Intention of Matthew 23 (Leiden: E. J. Brill, 1979); Reading Matthew: A Literary and Theological Commentary on the First Gospel (Macon: Smyth and Helwys: 2000); Mark, NIVAC (Grand Rapids: Zondervan, 1996) and translated into Spanish; Colossians / Philemon, NIVAC (Grand Rapids: Zondervan, 1998) and translated into Spanish; 2 Corinthians (New American Commentary; Nashville: Broadman and Holman, 1999); "Gospel of Mark" in Zondervan Illustrated Bible Backgrounds Commentary (Grand Rapids: Zondervan 2002); and 1 Corinthians, Baker Exegetical Commentary on the New Testament (Grand Rapids: Baker, 2003); and he has published more than fifty articles. The commentary on Mark received a Silver Medallion from the CBA in 1996. The "Gospel of Mark" received the Gold Medallion in 2003, and the commentary on 1 Corinthians received a Silver Medallion from the CBA and an Award of Merit from Christianity Today in 2004. He served as the New Testament editor for the revision of the Expositor's Bible Commentary for which he wrote the commentary on Philippians. He co-authored with his wife Diana, Dean of the School of Social Work at Baylor, Flawed Families of the Bible: How God's Grace Works Through Imperfect Relationships (Brazos Press), which has been translated into Korean and Russian. His most recent book is a commentary on Luke for the Zondervan Exegetical Commentary series (2011). He is an elected member of Studiorum Novi Testamenti Societas. Dr. Garland remains closely connected to local church ministry and has served as Interim Pastor of sixteen churches in Kentucky, Indiana, and Texas. He became Associate Dean for Academic Affairs at Truett in 2000 and has preached in numerous churches throughout the U.S., Australia, and Africa. Garland's commentary is an eminently worthy addition to this series. Following a brief but instructive introduction in which he deals with such matters as the various reasons for which Matthew wrote his Gospel, Garland confidently guides the reader through Matthew's story of Jesus. Commenting on the text section by section, Garland apprises the reader of the movement of the story's plat and highlights through the theology that Matthew conveys through the art form of narration. Pastors and students will not only benefit greatly from this commentary but will also applaud both the incisvieness of Garland's comments and the clarity of his prose.